Injectable fillers help to remove lines and wrinkles. Results are immediate and very soft and beautiful. Dermal Fillers: Some stimulate the production of collagen, like Sculptra, while others restore hyaluronic acid, which is naturally occurring and keeps skin looking smooth and hydrated. Dermal fillers can be used to treat multiple areas. Our practitioners can help determine which filler(s) would be right for you. -JUVÉDERM® Ultra XC adds more fullness and plumps thin lips—whether your lips have thinned over time or you simply want fuller lips. -JUVÉDERM VOLUMA® XC adds volume to correct age-related volume loss in the cheeks to help create a more youthful appearance. -JUVÉDERM VOLBELLA® XC adds subtle volume to lips and softens the appearance of vertical lip lines. 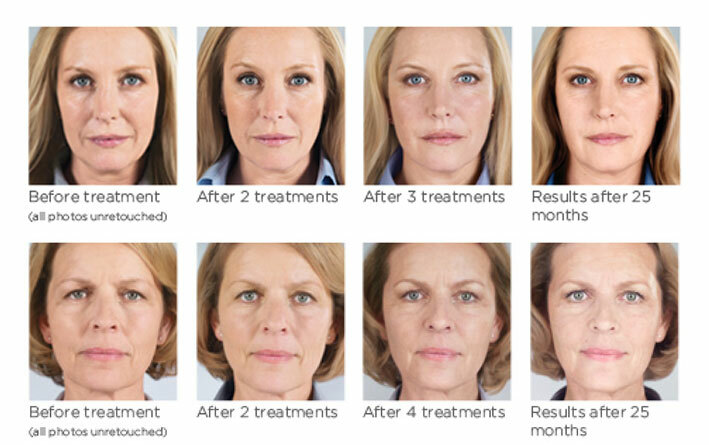 -Sculptra® Aesthetic is made from poly-L-lactic acid and works gradually to stimulate collagen production. It is a long-lasting volumizer. What can I expect from dermal fillers? Dermal fillers correct specific areas, filling deeper wrinkles, plumping lips, and restoring lift and volume to areas of the face that appear hollowed or sagging. Fillers offer immediate, visible results that can last from a few months to few years. Mild, temporary bruising and swelling can occur. DIMINISH THE DOUBLE CHIN WITH A TREATMENT TAILORED TO YOU.